This week marks the ninth anniversary of the founding of the Pauling Blog, a project that, as we’re fond of pointing out, was created to help publicize the issuing of a postage stamp. 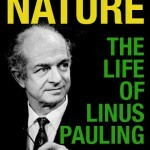 In the years that have followed, the blog has evolved significantly to where it now stands as a resource of consequence for those interested in studying the life and work of Linus Pauling and his milieu. The Pauling Blog is a product of the Special Collections and Archives Research Center at the Oregon State University Libraries. SCARC, as we are more commonly known, consists of twelve professional staff and fifteen student assistants who pursue any number of activities that support our five major collecting themes: the history of OSU, the history of science, natural resources in the Pacific Northwest, multicultural communities of Oregon, and rare books. These days, the bulk of our outreach related to Linus Pauling centers around this blog, and we are lucky to have two students on staff, working a total of about 20 hours per week, whose primary job responsibility is to research and write in support of the project. We have found that it takes a commitment at about this level to maintain a weekly publishing schedule of well-formed posts that average about 1,000 words each. The two students who currently write for the project are just the latest in a long line of contributors — over the years, dozens of individuals have written pieces for the blog. Though the resources required to produce at this rate are not trivial, we are glad to say that there is no slackening in the institutional support that drives the Pauling Blog. As such, our readers should continue to anticipate the appearance of fresh content just about every week for the remainder of 2017 and beyond. As we create more content, our viewership rises and, in 2016, we averaged more than 10,000 views per month for the first time in project history. These numbers certainly don’t put us on a par with, say, the Huffington Post, but we are proud of the niche that we have carved out within the history of science blogosphere. Today’s post is #615 and, as with last year, we are celebrating our birthday by shining the spotlight on a few favorites that more recent readers may not know exist. For our eighth birthday, we linked to eight sets of posts from 2008-2010 that we felt deserved a second look. Today, for our ninth birthday, we present a list of nine that first appeared in 2010 through early 2013. Introduction to Quantum Mechanics (2010). A four-part series examining the writing and impact of one of Pauling’s first books, the influential Introduction to Quantum Mechanics, co-authored with E. Bright Wilson, Jr. and published in 1935. The Senate Internal Security Subcommittee Hearings (2010). A five-part series on Pauling’s June 1960 SISS hearing, coupled with three more posts on his second hearing in October, stand as an important contribution to the historical understanding of an extremely trying chapter in Pauling’s life. The Pauling FBI Files (2011). An in-depth analysis of Pauling’s lengthy Federal Bureau of Investigation file and, by extension, of his life as an object of government surveillance. “Kevorkian, Pauling, and a Twist on Capital Punishment” (2011). A single post on Pauling’s correspondence with Jack Kevorkian and Kevorkian’s idea of providing condemned prisoners with the option of donating their deaths to science. Vitamin C and the Common Cold (2011). Four posts that dig into the science behind Pauling’s belief that Vitamin C can do wonders for those who are fighting colds or who wish to avoid them altogether. The Story of Ralph Spitzer (2012). The struggle of Ralph Spitzer, a brilliant protégé of Pauling’s who was persecuted here at Oregon State for his political beliefs, is spelled out in three posts. The Quasicrystals Debate (2012). This is probably the most ambitious piece of science writing that we have ever attempted. We are very proud of these four posts, which take on a complicated but fascinating controversy from the last years of Pauling’s life. Crellin Pauling (2012). A biography in two posts of Linus and Ava Helen Pauling’s youngest son who, sadly, was the first of the Pauling children to pass away. Pauling’s Patents (2012-2013). A sprawling set of thirteen posts focusing on Linus Pauling’s many patents and patent disclosures. Topics covered include cold fusion, rocket propellants, superconductivity, and improved road signs, among many others. Much more of this to come. As always, we thank you for reading. In her presentation, which is available online here, Lubchenco detailed a collection of scientific activities and policy initiatives that are helping to rehabilitate the world’s fisheries and that inspire optimism for the health of our oceans moving forward. Lubchenco’s talk focused in particular on the positive impact that the implementation of Rights-Based fisheries management policies have made in promoting sustainable fishing practices world-wide. In addition, the creation of marine reserves and the formation of international agreements to more strictly police and prosecute illegal, unregulated, and unreported fishing, have fostered, in Lubchenco’s view, an increasingly stable marine environment in which the ocean’s bounty might be rehabilitated and used more widely. 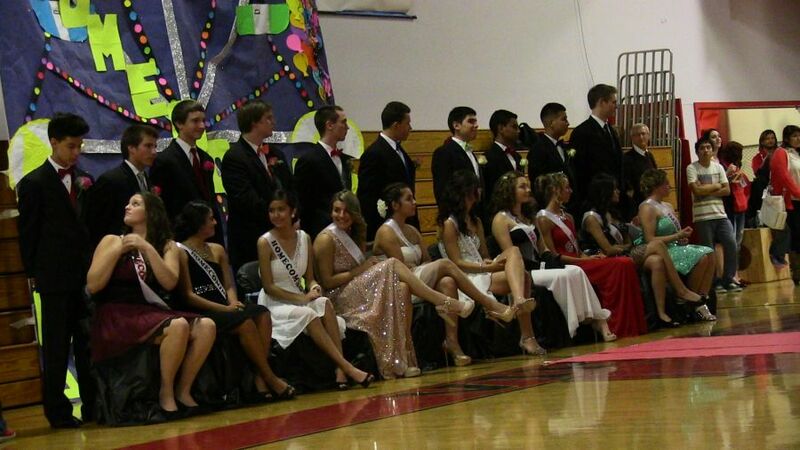 A few images from a memorable evening are included below. Invited guests mingling at a reception held prior to Dr. Lubchenco’s talk. Jane Lubchenco receiving the Pauling Legacy Award certificate from Faye Chadwell, University Librarian and Director of the OSU Press. A close-up of the Pauling Legacy Award certificate. Lubchenco posing with the Pauling Legacy Award medal. The crowd assembling at the Oregon Historical Society Museum prior to Dr. Lubchenco’s talk. Lubchenco’s talk was introduced by Dr. Cynthia Sagers, OSU’s Vice President for Research. Evidence of a tough loss for Oregon Agricultural College the autumn after Pauling graduated. We are very pleased to announce that Dr. Jane Lubchenco will receive the 2016 Linus Pauling Legacy Award in Portland, Oregon on Tuesday, April 26th. Lubchenco will receive the Legacy Award and deliver a lecture at an event that is free and open to the public. Details are as follows. 2016 Linus Pauling Legacy Award Lecture, to be delivered by Dr. Jane Lubchenco. Tuesday, April 26th, 7:30 PM. Oregon Historical Society Museum, 1200 SW Park Ave., Portland, Oregon. President Obama receives a briefing in the Situation Room of the White House on the BP oil spill in the Gulf of Mexico, July 21, 2010. Lubcheno is seated at right. Dr. Lubchenco holds the title of university distinguished professor and advisor in Marine Studies at Oregon State University and was formerly the administrator of the U.S. National Oceanic and Atmospheric Administration (NOAA) and under secretary of Commerce for Oceans and Atmosphere. She is the ninth recipient of the Legacy Award, which was first given in 2001 to recognize achievement in an area once of interest to Linus Pauling. In addition to her work at Oregon State University, Lubchenco is currently serving as the first U.S. Science Envoy for the Ocean and is an international expert on marine ecology, environmental science and climate change. She is a pioneer in the development of marine protected areas and reserves and in fisheries reform, which are complementary efforts to return fisheries to sustainability and profitability while also protecting habitats and biodiversity. With a Ph.D. in ecology from Harvard University, Lubchenco is one of the most highly cited ecologists in the world, and she has received numerous awards including a MacArthur “genius” award and 20 honorary doctorates. Her academic career as a professor began at Harvard University and continued at Oregon State University (1977-2009) until her appointment as Administrator of the U.S. National Oceanic and Atmospheric Administration (NOAA). Following her work at NOAA, Lubchenco was Distinguished Visitor in Public Service at Stanford University and then she returned to Oregon State. The OSU Libraries Special Collections and Archives Research Center has conducted two oral history interviews with Lubchenco, which are available online. Lubchenco also participated in a conference that was organized by the OSU Libraries in 2007 and titled “The Scientist as Educator and Public Citizen.” Her lecture from that event, “Advocates for Science: The Role of Academic Environmental Scientists,” may be viewed here. Lubchenco’s lecture in Portland is wheelchair accessible. Individuals requiring other accommodations should contact Don Frier at 541-737-4633 or don.frier@oregonstate.edu by April 20 so that appropriate arrangements can be made. The Linus Pauling Legacy Award was founded in 2001 by Pauling’s eldest son, Linus Pauling Jr., and was originally named the Linus Pauling Centennial Award. The Oregon State University Libraries assumed administrative responsibilities for the award in 2004 and have granted it biennially ever since. Past recipients have included four Nobel Prize winners – Joseph Rotblat (2001), Roderick MacKinnon (2008), Roger Kornberg (2010), and Roald Hoffmann (2012). Honorees receive a framed certificate, an engraved medallion, and an honorarium of $2,000. This week, we celebrate the eighth anniversary of the founding of the Pauling Blog. We began this project in March 2008 to announce the release of a postage stamp and, in the years that have followed, we have published over 560 posts and written well-over 500,000 words. The scope, mission, and workflow propelling the Pauling Blog have changed mightily since spring 2008, and our audience has steadily grown year-over-year, to the tune of nearly 120,000 views in 2015. We expect that a few people have been following this project since its inception, but for the many more who are relative newcomers to the Pauling Blog, we thought we would mark today’s anniversary by calling attention to eight posts or posting series that we put together in our very early years. Roger Hayward (series). This collection of posts, run in April and May 2008, eventually morphed into a much larger project detailing the life and work of the remarkable man who illustrated many of Pauling’s publications, and did quite a bit more beyond that. The Guggenheim Trip (series). Published in June 2008, this series marked our first foray into fairly detailed original research. Those who know Pauling’s story will also know that the 1926-27 Guggenheim trip was critical to his future successes as a structural chemist. “A Halloween Tale of Ice Cream and Ethanol.” Released on Halloween day 2008, this lighthearted post actually provides some pretty interesting insight into Pauling’s personality – he truly never stopped being a scientist. “Linus Pauling and the Search for UFOs“. This post appeared on May 11, 2009 and became the source of a good amount of attention. A sequel of sorts was released last year as part of our examination of Pauling’s years at the Center for the Study of Democratic Institutions. Pauling’s Theory of Anesthesia. (series) Another batch of early original research of which we remain proud. Over time, the Pauling Blog has placed greater emphasis on exploring components of Pauling’s work that are admittedly more tangential, and thus under-researched by his stable of biographers. His theory of anesthesia, which occupies a single solitary box in the Pauling Papers, certainly fits that description. The anesthesia posts were published in June 2009. The Pauling Chalkboard. (series) Those who have visited the reading room of the Special Collections and Archives Research Center at Oregon State University’s Valley Library will likely have seen and taken a moment to ponder Pauling’s chalkboard, which is on permanent display in our facility. Countless visitors over the years have asked us to decipher Pauling’s annotations on the board, and in December 2009 we finally got around to conducting a rigorous analysis of the board’s contents. Pauling’s Life-Threatening Kidney Disease. (series) In 1941 Pauling was diagnosed with glomerulonephritis, a kidney condition that, at the time, was basically a death sentence. The approach that Pauling took to treating his disease is insightful on many levels: 1) that it worked; 2) that it was arguably his first experience of orthomolecular medicine; 3) that the physician who saved his life likely would have been blacklisted for his political views, had he himself lived long enough; and 4) the crucial role played by Ava Helen Pauling in nursing her husband back to good health. The nephritis series was released in March 2010, right around the time of the blog’s second birthday. As always, thanks for your continued readership. We’re glad to say that we have plenty more in store for 2016. On Monday, April 21st, Dr. Zia Mian became the eighth individual to receive the Linus Pauling Legacy Award, granted every other year to an individual who has achieved in an area once of interest to Linus Pauling. Mian’s talk, “Out of the Nuclear Shadow: Scientists and the Struggle Against the Bomb,” provided an informative and often sobering view of the history of anti-nuclear activism within the scientific community and the challenges that the world continues to face today as nuclear technologies become more widespread. Mian’s talk, once transcribed, will be made freely available on the website of the Oregon State University Libraries Special Collections & Archives Research Center in the coming weeks. We’ll be sure to pass along word as soon as it goes live. In the meantime, here’s a glimpse of the event, which took place at the Oregon Historical Society Museum in downtown Portland. Dr. Mian with former OSU Libraries Resident Scholar, Linda Richards. Guests mingling at the pre-dinner reception. A peek at the VIP dinner that preceded Dr. Mian’s talk. Zia Mian posing with the Pauling Legacy Award medal. Mian delivering his remarks upon receiving the Legacy Award. 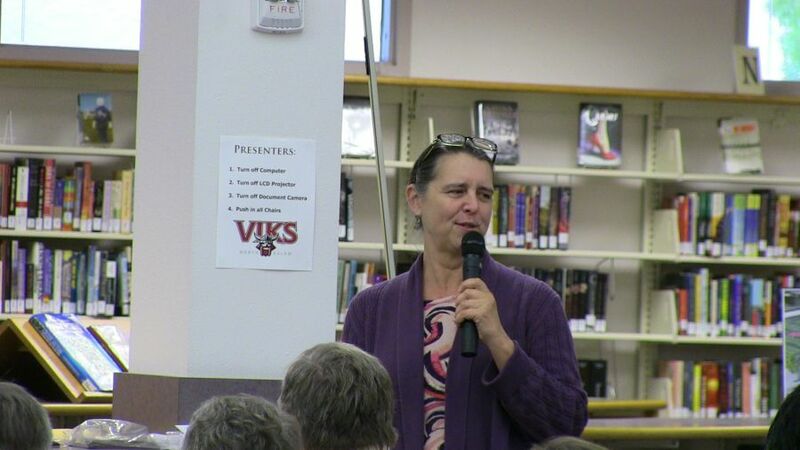 University Librarian and Press Director Faye Chadwell, greeting the audience. 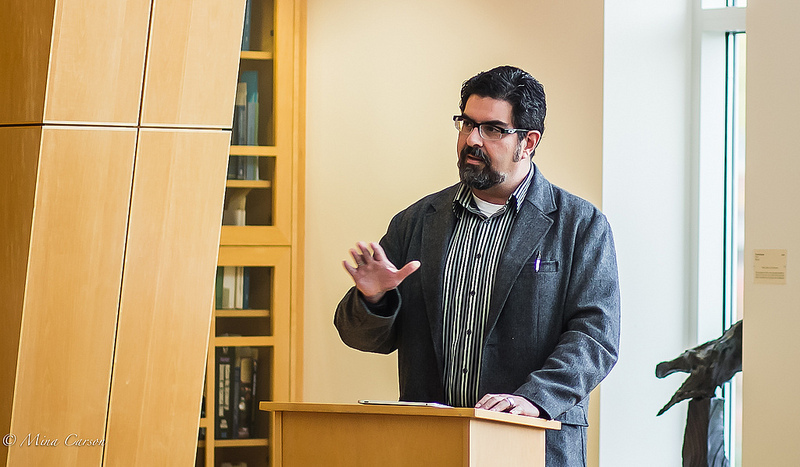 Dr. Jose-Antonio Orosco, Director of the OSU Peace Studies Program, introducing Dr. Mian. Bust of Pauling with a lei of peace cranes. Image courtesy of Mina Carson. On October 10th, 1963, the Limited Test Ban Treaty came into effect, having been agreed to some two months prior by the United Kingdom, Soviet Union, and United States. 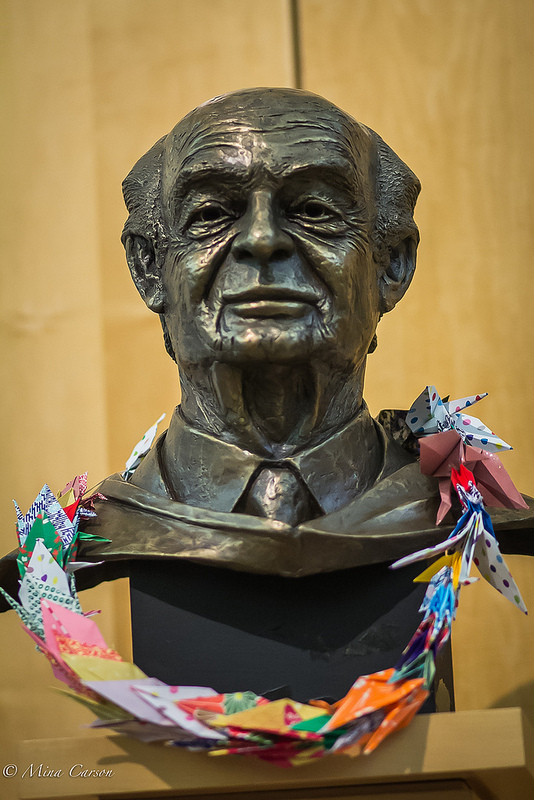 On the same day, Linus Pauling received notice that he had belatedly won the 1962 Nobel Peace. To commemorate the 50th anniversary of these events, the OSU Libraries Special Collections and Archives Research Center sponsored a roundtable discussion on the impact and legacy of the treaty. 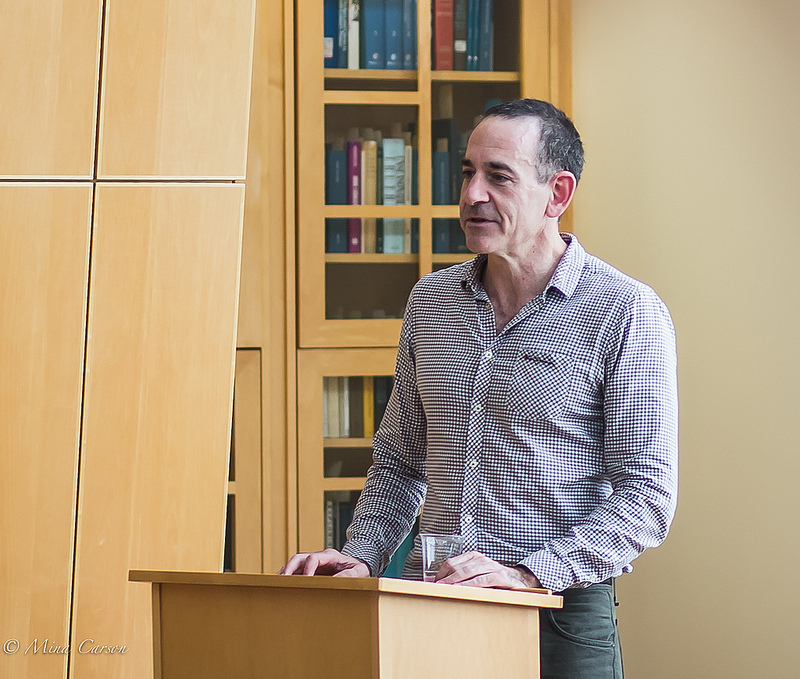 The event was held in our reading room on Friday, October 11th. The afternoon began with the opportunity to browse items from our collection directly related to the signing of the treaty. A table was also set up for attendees to fold origami peace cranes. Afterward, Christopher McKnight Nichols, Jacob Darwin Hamblin, and Joseph Orosco from OSU’s School of History, Philosophy, and Religion were joined by Tim Naftali of the New America Foundation to start the roundtable with brief comments before opening up a larger discussion that included an audience eager to weigh in on the issues surrounding the control of nuclear weapons. Christopher McKnight Nichols. Image courtesy of Mina Carson. Christopher McKnight Nichols, Assistant Professor in History at OSU, began with a historical overview of international efforts to control nuclear weapons from their wartime use by the United States against Japan in 1945 to where the situation stands today. The first loud calls for banning the testing of nuclear weapons came in 1954 as fears began to rise about potential expanded use in theatre as well as the dangerous effects of radiation. The Limited Test Ban Treaty of 1963 was the first international agreement affecting nuclear weapons. From there, activists’ goals broadened to include a comprehensive test ban that would, as Nichols stated, “ban nuclear testing at any time, at any place, by any state.” The reality of the 1963 treaty assumed a less ambitious form, banning only atmospheric and underwater testing, thus allowing for the continuation of underground tests. Efforts in support of a comprehensive ban persisted into the 1970s and 1980s with little progress beyond the Threshold Test Ban Treaty of 1974 between the Soviet Union and United States, which banned the underground testing of bombs larger than 150 kilotons. For sake of comparison, the bombs dropped on Hiroshima and Nagasaki were roughly 15 to 20 kilotons in magnitude. After the end of the Cold War, the push for a stronger, universal ban led to broader support for the Comprehensive Nuclear Test Ban Treaty, which came open for signature in 1996. Ratification of the treaty is still pending since it requires that all forty-four of the known nuclear powers sign on. So far, eight such countries have yet to do so: China, the United States, Egypt, Iran, India, Pakistan, Israel, and North Korea. Despite this lack of ratification, major nuclear powers including China, the United States, Russia, and the United Kingdom did agree to a moratorium on testing in the 1990s that is still in effect today. Nichols concluded his remarks by suggesting that a ratified comprehensive test ban treaty may still be far away because, for some emerging countries, acquiring a place at the diplomatic table is viewed as tied to carrying out the testing of a nuclear weapon. Tim Naftali. Image courtesy of Mina Carson. Tim Naftali, who is National Security Fellow at the New America Foundation and former Director of the Richard Nixon Presidential Library, looked back at the circumstances surrounding the enacting of the Limited Test Ban Treaty in 1963. In June of that year, President John F. Kennedy met with civil rights leaders including A. Philip Randolph and Martin Luther King Jr. to acknowledge the impact that their efforts in the streets had made on his own decisions. Naftali pointed out that there was no equivalent recognition of the peace movement by Kennedy regarding the Limited Test Ban Treaty. This suggests that Kennedy perhaps did not need any push on these matters from people like Linus Pauling and, in supporting the treaty, was simply carrying on what was already in progress. At the US-USSR Geneva Conference in 1956, President Dwight Eisenhower proposed an Open Skies Treaty. The agreement would allow for each state to fly its aircraft freely over the other’s land. Behind the scenes, the Soviet response was mixed. Soviet military leaders were in support, seeing it as great opportunity to close the intelligence gap with their chief rival. Naftali said that this assessment made Premier Nikita Khrushchev “furious.” Allowing the United States to fly freely over Soviet territory would expose the Soviets’ substantial weakness, which Khrushchev had spent so much time covering up through public bravado. Naftali compared Khrushchev’s posturing to that of a puffer fish that makes itself larger to deter predators. In the end Khrushchev prevailed, and the Open Skies Treaty was never signed. Not until the 1987 Intermediate-Range Nuclear Forces Treaty, under a more willing Mikhail Gorbachev, would the Soviets open up to onsite inspections. By 1963 nuclear war emerged not only as a threat to the people of the Soviet Union and United States, but also to the respective ideologies of each country. While Khrushchev was confident in the orthodox Marxist historical progression that saw communism as the inevitable successor to capitalism, he was less certain that communism could survive a nuclear war, thus rendering efforts like the Limited Test Ban Treaty more attractive. Kennedy similarly saw nuclear war as the only real threat to realizing the American Dream, yet the development of nuclear weapons was still of value. The worth of the treaty, for Kennedy, was that it changed the rhetoric of U.S.-Soviet relations from that of enemies to one that was more businesslike, emphasizing, as Naftali described it, “competition on economic and social grounds, not on military grounds.” The success of the treaty, in this case, was defined by the diplomatic conditions that it helped to create and foster. Jacob Hamblin at the podium. Image courtesy of Mina Carson. 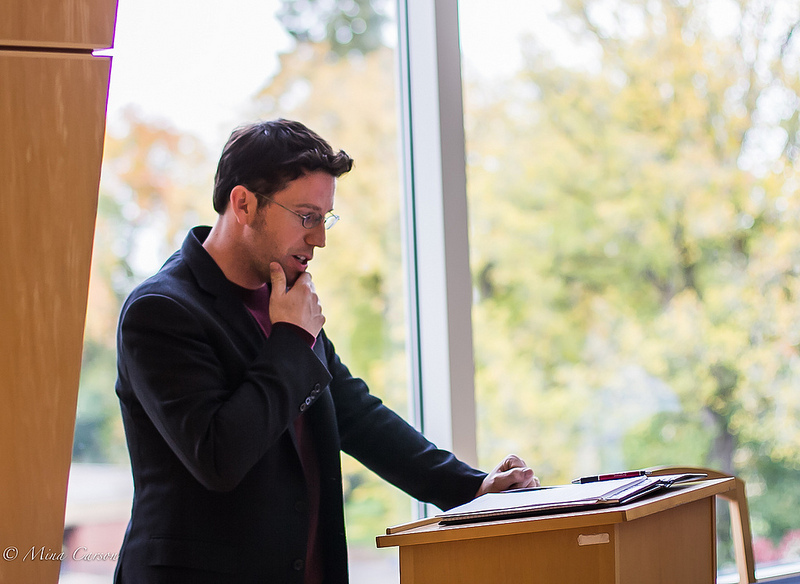 Jacob Darwin Hamblin, Associate Professor of History at OSU, challenged the idea of looking at the Limited Nuclear Test Ban Treaty strictly in terms of its diplomatic significance. Health and environmental questions were central to efforts, like those of Linus Pauling, to ban nuclear testing before the treaty. By enacting the treaty, Hamblin said, these questions were obscured and even dismissed as the parties to the treaty no longer had to answer to allegations made by their own citizens or other countries who had no part in testing, but were still affected by fallout from the tests. The treaty itself can easily be thought of as a recognition of the harmful effects of testing nuclear weapons. Yet the activity of the Soviet Union and United States in the year leading up to the ban – cognizant that their time to test weapons as they pleased was running out – saw a surge in the number of tests being conducted, with the United States carrying out 105 and the Soviet Union 138. For the United States this rash of testing included exploding bombs in the newly discovered Van Allen radiation belt, which extends 600 to 37,000 miles above the surface of the Earth. One atmospheric test, called Starfish Prime, created an electromagnetic pulse that knocked out power in Hawaii. Environmental observers also looked on the UK’s “Big Freeze” winter of 1962-1963 as a possible consequence of the large amount of testing that had gone on just before the ban. Exploding large bombs in the atmosphere may indeed have had unexpected effects. For the United States, the rationale behind continued testing was to act as a deterrent to the Soviet Union. But as Hamblin stated, other countries did not care about that rationale as the potential harm it could cause far outweighed any benefit the United States could have received. Joseph Orosco. Image courtesy of Mina Carson. 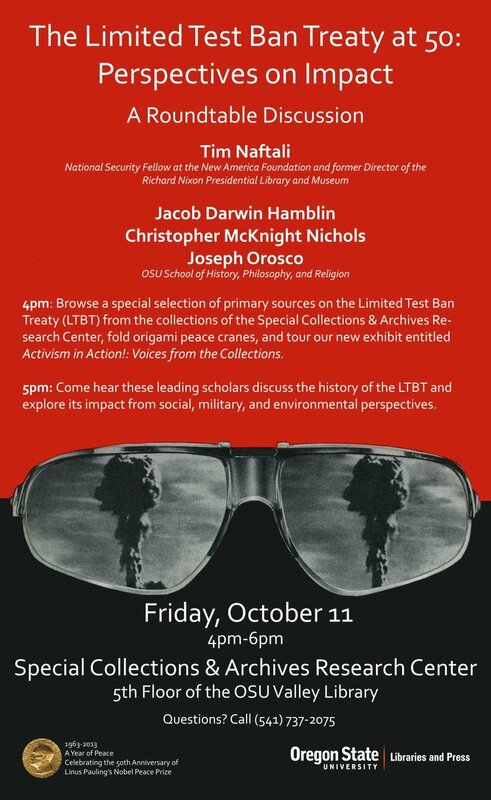 Joseph Orosco, Associate Professor of Philosophy at OSU, looked at the Limited Test Ban Treaty from yet another angle. According to Orosco, the treaty demonstrated the ability of ordinary people to pressure government leaders into action. While Kennedy himself may not have acknowledged the influence of the peace movement (as suggested by Tim Naftali) people close to him did. Jerome B. Wiesner, Kennedy’s science advisor, had said that groups like SANE, Women Strike for Peace, and Linus and Ava Helen Pauling in particular were very influential on Kennedy’s decision to support the treaty. The significance of the peace movement did not stop with the treaty. In 1957 a group of Chicago Quakers formed a committee to stop nuclear weapons testing in hopes that it would bring together various pacifist groups. One step toward this goal was activity in support of what would become the Limited Test Ban Treaty of 1963. Because of the variety of people involved, two separate groups emerged: the Committee for Non-Violent Action and the Committee for a Sane Nuclear Policy. The Committee for Non-Violent Action organized around Gandhian nonviolent resistance in order to change opinions about nuclear testing. The group’s tactics included putting themselves in harm’s way to highlight the tests’ dangers. In 1957 committee members broke into a Nevada test site. The next year members Albert Bigelow and George Willoughby attempted to sail from Hawaii to the Marshall Islands test site but were arrested before getting there. These strategies, Orosco argued, would serve to influence later activist movements. Willoughby himself would become a nonviolent trainer and help start the Movement for a New Society in West Philadelphia, the goal of which was to demonstrate communal living under anti-racist and feminist values. The community developed general assemblies for use in consensual decision making, methods that became more important within non-violent movements during the 1999 World Trade Organization protests in Seattle and the recent Occupy movement as well. The Committee for a Sane Nuclear Policy assumed greater prominence than did the Committee for Non-Violent Action because of its more direct educational and lobbying efforts. Norman Cousins, who was the group’s chairman, engaged in back door diplomacy between Kennedy and Khrushchev, meeting with both leaders individually to discuss nuclear policy. Cousins has been credited for pushing Kennedy to give his American University “Open Door” speech in early 1963, which has been seen as influential in prodding Khrushchev to agree to the Limited Test Ban Treaty. For SANE a downside to working so closely with American and Soviet politicians was the consequent need to demonstrate to the American public that the group was free of communist sympathizers. This imperative ended up turning many people, including Ava Helen Pauling, away from the committee, as they saw the anticommunist activities as a major distraction from the group’s stated goal. This splintering led to the formation of separate groups like Women Strike for Peace that also prefigured later, more decentralized forms of social justice organizing up still influential to the present day. For Orosco, the Limited Test Ban Treaty was successful in “organizing, energizing, and empowering” people to take control away from elites who had been leading the world toward destruction. Their efforts demonstrate the power of the people to help bring peace to the world. 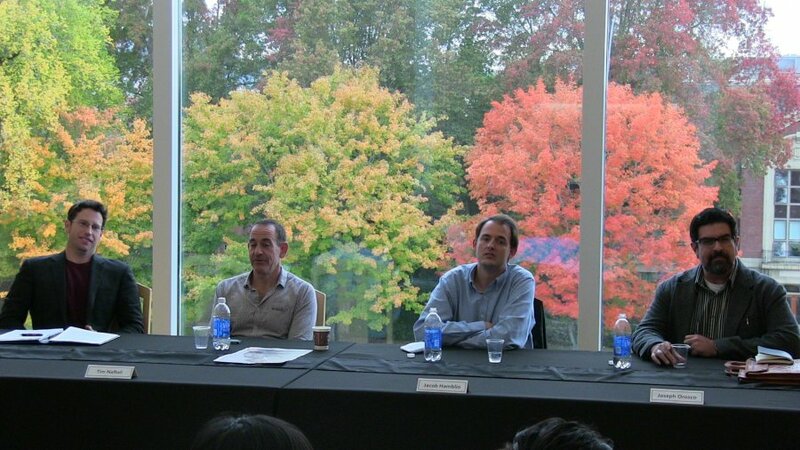 The panelists assembled on a beautiful fall afternoon in Corvallis. After each member of the panel had finished presenting, the floor was opened to questions and comments from those in attendance. To start off, the discussion centered on the role and relevance of nuclear weapons in the present climate of international politics. Nichols downplayed any tactical benefits that could come from nuclear weapons for nations like the United States as a larger variety of weapons now available can fulfill tactical needs at far less cost in terms of international outrage. Where there is concern though, is among smaller states who have access to nuclear technologies but not other weapons. Hamblin agreed, saying that nuclear weapons have been crucial regarding strategy but are not crucial at this moment for maintaining the position of the United States in the world. Because of this, Hamblin felt it more relevant to focus on banning other types of weapons that are used in current wars. An audience member expanded on Hamblin’s point and asked if focusing on any type of weapon distracts from the underlying violence of war. Orosco responded that certain weapons have always been seen as “game changers.” These weapons have included the introduction of the crossbow in medieval times and, more recently, the use of chemical weapons in Syria. Perceptions of these weapons as being particularly dangerous are based on their capacity to destabilize the ruling social and economic order. Orosco suggested focusing on means to promote social and economic stability as ways to lessen the recourse to violence and promote peace. Nichols offered another perspective, pointing out that “game changers” are often more indiscriminate and less targeted in their effects. Efforts to outlaw certain weapons have typically focused on a desire to protect civilians and establish agreements on lawful and unlawful warfare. Orosco noted that even Thomas Aquinas, the thirteenth century Catholic theologian, sought to justify the violence of war with his doctrine of double effect, which morally exonerated individuals who caused others harm if they did so for a greater end. With this, Orosco suggested that war itself is uncontrollable at any level and efforts to promote peaceful relations should be more prominent than those to lessen violence. Once the more formal discussion ended, conversations continued around the issues raised throughout the event as people slowly trickled out the doors. So concluded the first in OSU’s year-long series of events commemorating Pauling’s Nobel Peace Prize. 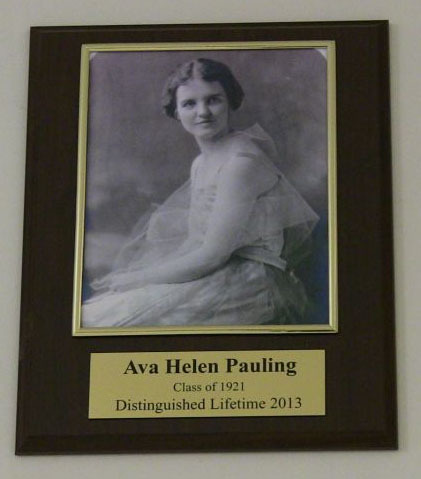 Recently the blog took a field trip a few miles up I-5 to North Salem High School, where Ava Helen Pauling was inducted into the school’s hall of fame. A grand old building dedicated in 1937, the current school is not at the same location as the facility where Ava Helen spent her high school years, but it is the successor to the original Salem High School, which once existed in a downtown space now occupied by a department store. North Salem’s 2013 hall of fame class included a former wrestler, a retired teacher and an alum who spearheaded the creation of a scholarship fund for outstanding students. Ava Helen was inducted in the Distinguished Lifetime category, her nomination penned by Emily Schwab, a member of North’s class of 2009 and a recent history graduate here at Oregon State University. Cheryl Pauling sharing memories of her grandmother in the North Salem H.S. library. 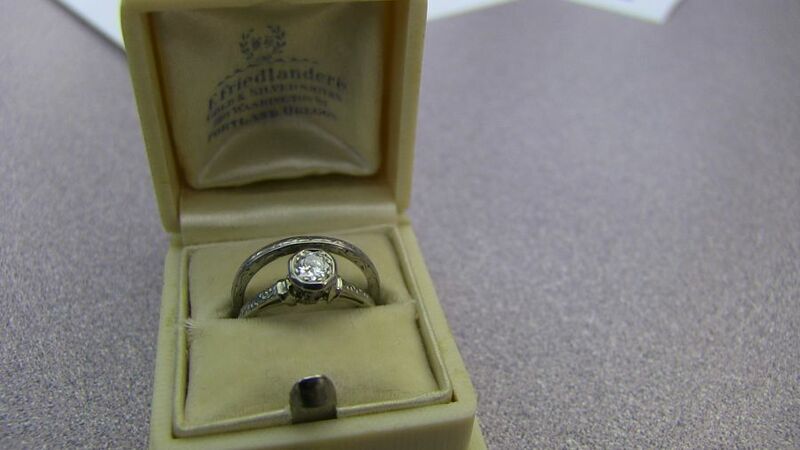 Ava Helen’s wedding ring, which Cheryl brought to show. 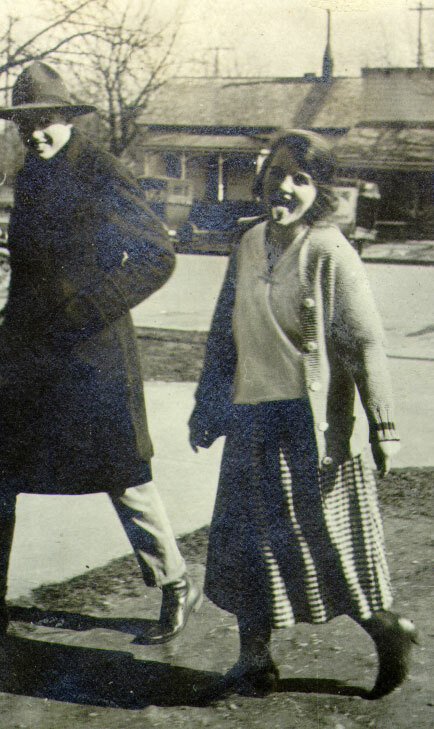 Though she grew up more than forty miles away in Beavercreek and later Canby, in 1918 Ava Helen moved to Salem, Oregon’s capitol, to live with her sister Nettie Spaulding and attend high school. It is not clear why this decision was made; possibly it related to family finances, Ava being one of twelve children afterall. It is possible too that the school in Salem was better than anything closer to where the Millers lived. Or maybe Ava Helen, ever independent, simply needed a little more space. 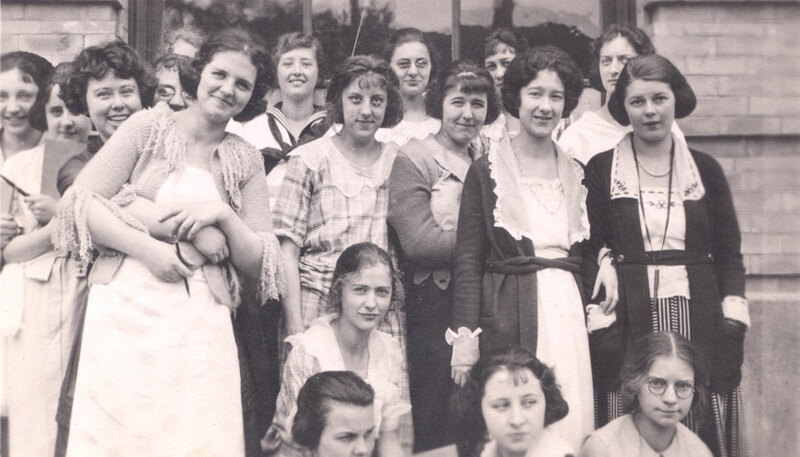 Ava Helen Miller at left, with some of her high school classmates, 1921. One senses that the Salem years were mostly happy for the young woman. [She] graduated from Salem High School in three years. She was class president her senior year. For her senior class picnic at Silver Creek Falls that spring she helped organize the food for a class of one hundred twenty-five. 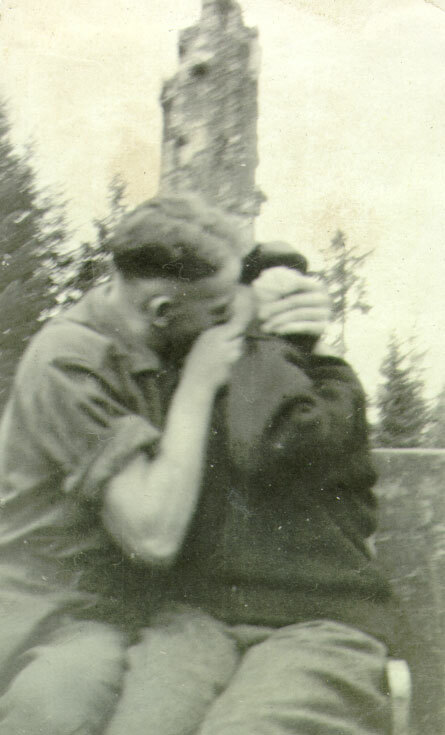 She dared kiss a boy for the camera. She was a girl of fun and will, as well as a sense of duty. 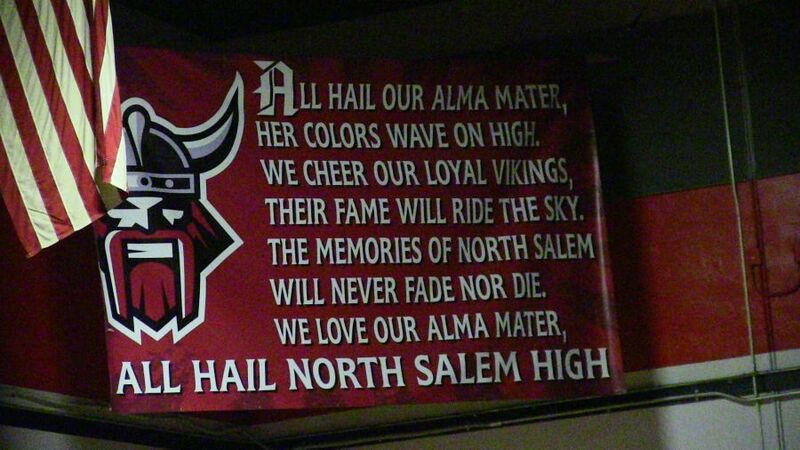 All hail North Salem High.